This is multiple growth points at this point, but I LOVE how it looks when it's all full like this! 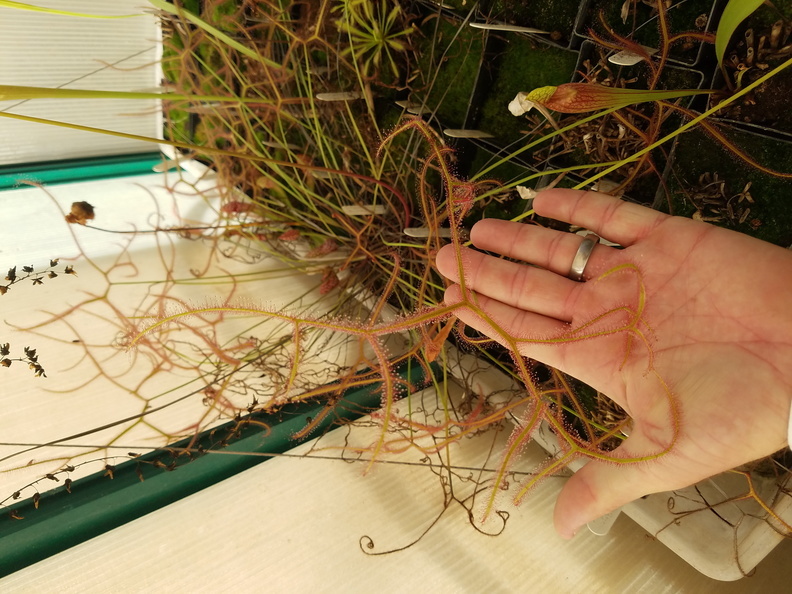 These are pretty huge, it stands about 12"-18" long and doesn't seem to put out a lot of leaves at a time like other D. binata. 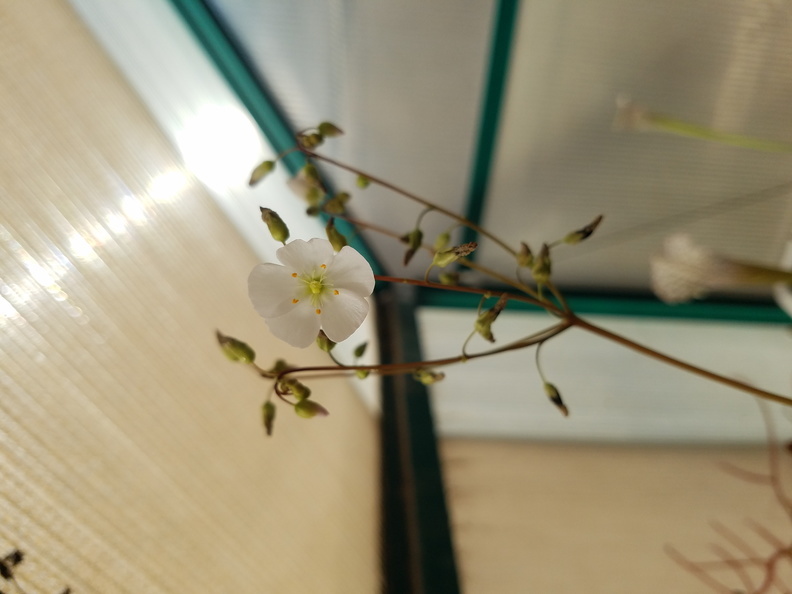 It flowers a frequently, but doesn't seem to make seed (on its own at least) The flower stalk is even very tall! 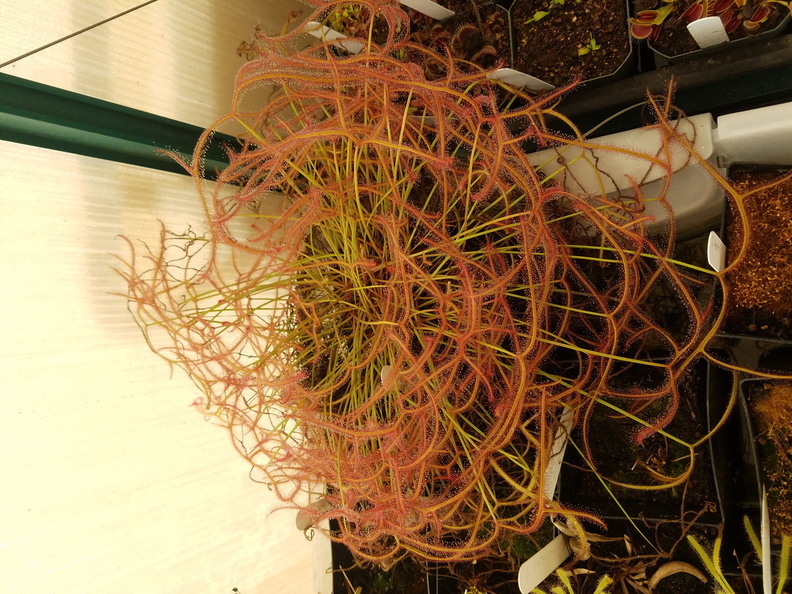 It looks like a plant I bought from Meadowview Biological Station, Drosera binata Dichotoma. It has similar coloration, size, and mix of T- Type and Multi-Point leaf shape. It's my understanding that D. dichotoma (or D. binata var. dichotoma) leaves always stand upright in good light. The drooping leaves are more typical of D. multifida. D. multifida will hold upright leaves under proper conditions; there are forms of both D. multifida and dichotoma that stand up and flop. 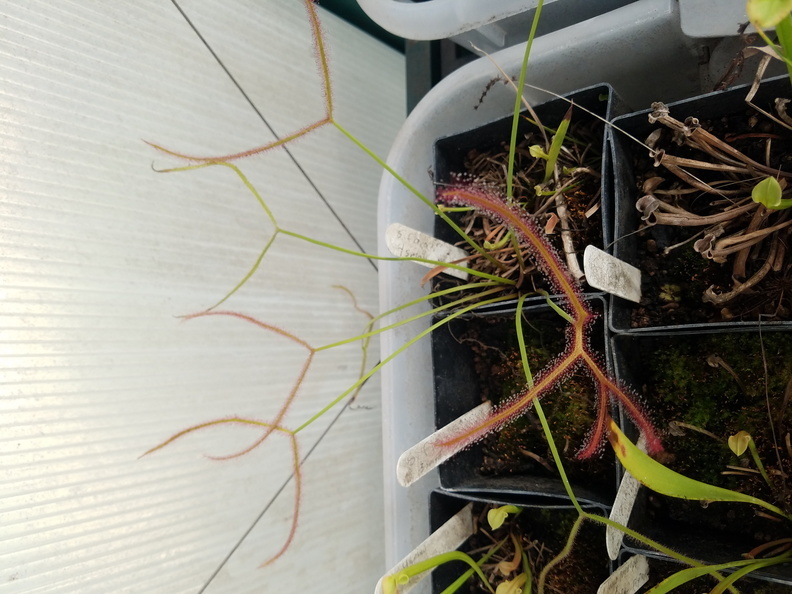 The first few photos do look like a hybrid of the two, large leaves and broad branch habit like dichotoma but increased branching and red color more similar to multifida. The last one if a different plant may well be a pure multifida form with that many branches. I can't wait for the taxonomic evaluation of this group. It's such a mess. Do you know if someone has taken it on and if so who? If the group ends up broken into many new species I'm not sure I will feel much enlightened by that. I would prefer subspecies but that is not the current trend. It's my understanding that Greg Bourke is working on it, though I could be wrong. I remember hearing that someone was doing work on South African species as well, but it seems like that should have been published by now. Based on what I know about this group, I would say that subspecies or even a lower rank such as the current variety ranking (I think some people even use forma right now?) would be the right call. It really depends on who's writing it up though, unfortunately. @ hcarlton Yes, the last one is a different one. I posted 3 different plants. Thanks for the info guys! Glad I wasn't just missing some clean cut way to identify each of them.